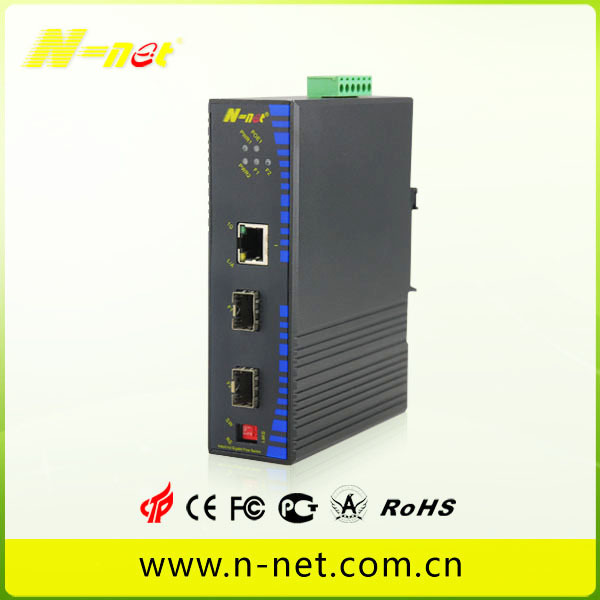 NT-IN321BF-1POE Gigabit POE Switch with one fiber series is an industrial-standard 3-port Gigabit Switch with dual fiber port redundancy, providing 1-port 10/100/1000BASE-TX Ethernet ports and additional one 100/ 1000Base-FX fiber ports. 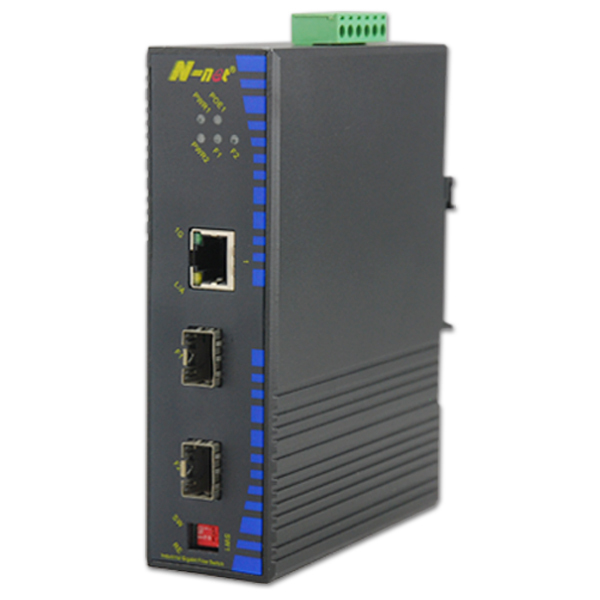 Rigorous industrial design makes it stable and reliable with basic protection, as well as flexible enough for Ethernet expansion in harsh industrial environments. When the main fiber broke down, NT-IN321BF Gigabit POE Switch with one fiber can switch to redundant fiber within 1ms. NT-IN321BF-1POE Gigabit POE switch with one fiber series is either rack-mountable with DIN rail or panel mounted in cabinet for easy installation. Wide range of working temperature, power supply backup, IP40 protection, LED indicators and compact design, all these make NT-IN321BF Gigabit POE switch with one fiber a perfect solution for special industrial application site. 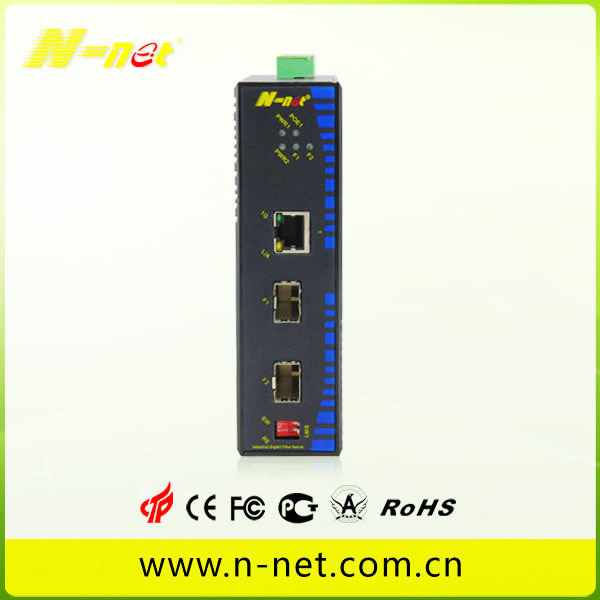 NT-IN321BF-1POE Gigabit POE switch with one fiber series is the POE version of NT-IN321BF with two POE Ethernet ports, powering POE IP camera, AP and IP phone over Ethernet cable. NT-IN321BF-AT (AF) supports IEEE802.3at with 25.5W output, compatible with IEEE802.3af. redundancy and multiple users access. * Support up to 1536 bytes packet. * IP40 standard protection housing. * Supports ESD protection at Ethernet port and EFT protection. * Easy installation, DIN rail or panel mountable. * Dual fiber multi mode, single mode and WDM single mode fiber compatible. Looking for ideal 10/100/1000M Ethernet Switch with POE Manufacturer & supplier ? We have a wide selection at great prices to help you get creative. All the Switch with Poe 10/100/1000M are quality guaranteed. 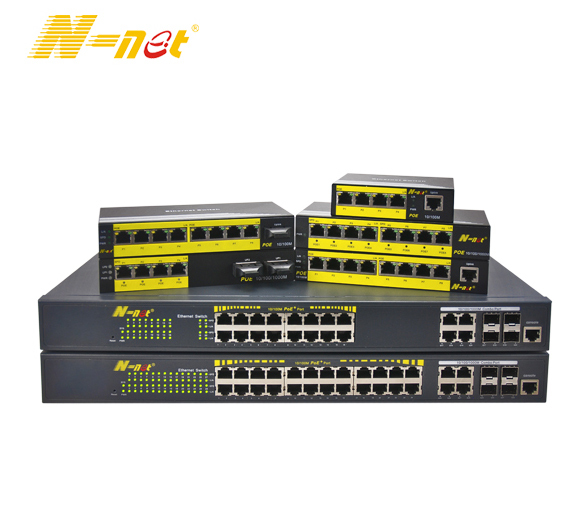 We are China Origin Factory of 10/100/1000M Switch with Poe. If you have any question, please feel free to contact us.